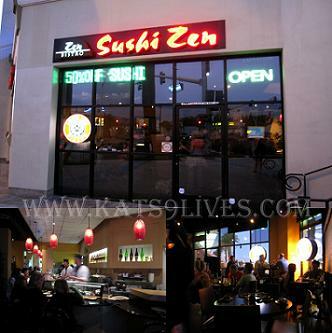 I was invited to a small B-day get together to Sushi Zen Bistro. As I walked through the doors I noticed the neon signs saying half off but I had just missed Happy Hour! =*( I was deeply saddened but there is always next time. It's a small restaurant with a sushi bar. The decor was your normal sleek dark tables and chairs. We all squeezed in the corner. My Evil Twin had a little mix up with the time so everyone else there was already done eating but we had just arrived. I decided to stay down and eat while everyone else went upstairs to get a drink. M.E.T. stayed and joined me for a little snack. Since there was a lot of stuff on the Happy Hour menu that I would have wanted but unfortunately missed, I opted out of trying anything that is not on that menu. One thing that really caught my eye was the Crunch Blue Crab Roll. I don't know why but that night I really wanted some blue crab. It's a simple roll of Blue Crab, Avocado, Tempura Flakes, and Teriyaki Sauce. The blue crab was very tasty and I did enjoy the tempura flakes that added a nice crunch. I love the strong seafood taste of the blue crab. Even though it was $10.95, it was a pretty generous size and worth the price. For sushi, I had to pick most stuff that is not on the Happy Hour menu so that I can get my money's worth. I decided to get a sushi order of the Japanese Hotate, Scallops. They came out fresh and it was a decent size. The other sushi I saw that looked tasty was the Hamachi Belly. You really can't go wrong with these two unless they weren't fresh. Both were decent cuts and fresh. but, im thinking of relocating back to the city close to here. and there are a few good places to get a fix.